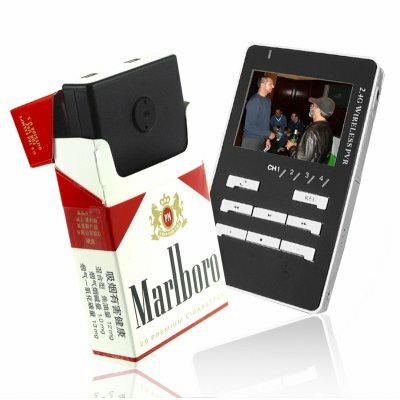 Successfully Added Cigarette Box Camera + Wireless Receiver / Recorder to your Shopping Cart. With this Cigarette Box Camera + Wireless Receiver / Recorder, no one will ever suspect that the pack of cards on the table is broadcasting their every move to you live! Would you like to peek in on your neighbors? Do you need to see what your coworkers are up to when you're out of the office? Do you want to play a trick on your teacher? Even better, how would you like to save a copy of everything you see on camera? We don't condone any of these activities, but we give you the tools you need to do them! This wireless camera is just the device for all your video surveillance needs. The camera's miniature size and box design make it easy to conceal. Hide the camera on bookshelves, in corners, or under tables to keep it out of view. Or just slide the camera into a pack of poker cards or cigarettes and hide it in plain sight! The included rubber casing holds the camera firmly in place so you'll never miss a minute of the action. The handheld wireless receiver / recorder lets you watch all the action from a safe distance nearby. You can hide next door or from over 20 meters away. Press the Record button and save all the action to use as evidence or to watch later. You can even plug the receiver into a TV, LCD monitor, or projector to watch all your secret footage on a big screen. Powerful functionality and ease of use make this camera and wireless receiver / recorder set perfect for amateur , surveillance enthusiasts, and gadget lovers of all ages. Chinavasion's no minimum order quantity (MOQ) lets you buy one to try yourself. Discounts for bulk orders let you save more when you stock up on this item for your store on online shop. This product uses the PAL color system. If you need an NTSC model please contact our Customer Service Team. Does this camera transmit audio? Yes, the camera captures audio, but only at a short range, like face-to-face conversations. The wireless receiver records audio and video. Can I watch footage from the camera on a TV? Yes. The wireless receiver has AV Out, so you can channel the footage to any device with AV In, including TVs, LCD monitors, and projectors. I am planning to sell this one eBay. Are there any other titles or keywords I should use for this type of product?